The laboratory is dedicated to the development and dissemination of novel techniques in neuroscience and biomechanics. Several of these approaches are described below along with a list of publications demonstrating their use. The laboratory has been using dynamically-scaled robots to study the aerodynamics of flapping flight since the early 1990s. The first instrument, built in collaboration with Karl Goetz in Tuebingen, was a simple 2D model of a translating and rotating wing equipped with force sensors. The device demonstrated that the leading edge vortex created at high angles of attack is sufficient to generate the elevated lift coefficients required to sustain flapping flight. The next generation device was robofly, designed primarily by Fritz Olaf-Lehmann while a postdoc in the lab. Robofly consisted of two wings that could generate the full degrees of motion of a flapping fly. The device had a wing span of 60 cm and flapped in mineral oil at 0.2 Hz to replicate the Reynolds number of a hovering fruit fly. The next iteration, bride of robofly or BORF, was built by Will Dickson and was capable of translating and rotating while flapping. Peter Polidoro redesigned the drive mechanism for BORF so that wing deviation and axial rotation are controlled by distal servo motors mounted within the robotic wing hinge. The system is capable of executing so-called captive trajectories, in which the motion of the robot’s body frame is not pre-programmed, but rather emerges from the forces and moments created by any arbitrary pattern of wing motion. The trajectory is computed based on an inertial model of the fly’s body and the forces and moments in the body frame measured with sensors on the robot. Dickinson, M.H., and Götz, K. (1993). Unsteady aerodynamic performance of model wings at low Reynolds numbers. J. Exp. Biol., 174: 45-64. Dickinson, M.H., Lehmann, F.-O., and Sane, S. (1999). Wing rotation and the aerodynamic basis of insect flight. Science 284, 1954. Sane, S. P. and M. H. Dickinson (2001). The aerodynamic effects of wing rotation and a revised quasi-steady model of flapping flight. J. Exp. Biol. 205: 1087-1096. Birch, J., Dickson, W., and Dickinson, M. H. (2004). Force production and flow structure of the leading edge vortex at high and low Reynolds numbers. J. Exp. Biol., 207, 1063-1072. Tethered flight simulators were first developed by Karl Goetz at the Max Planck Institute for Biological Cybernetics in the early 1960s. Initially, visual stimuli consisted of mechanically rotating cylinders and the fly’s intentions were measured using a torque compensator. Goetz later developed a technique for measuring stroke amplitude in real time by tracking the shadows of the wings. Inspired by his approaches, the laboratory has developed several generations of flight simulators in which LEDs and microprocessors replace rotating cylinders. These devices may be operated in open-loop mode, in which a fly is presented with a visual stimulus and its changes in wing motion are recorded, or in closed-loop mode, in which the fly’s motor actions control the motion of the visual panorama. Dave Smith (JFI Electronics), Fritz Olaf-Lehmann, and Michael Reiser all contributed to the various versions of the LED arenas. The instruments are now commercially available through companies such as IORodeo, founded by Will Dickson. Wingbeat analyzers for tracking wing motion may be purchased from the James Franck Institute Electronics shop at the University of Chicago. (The laboratory has no commercial affiliation with these businesses). More recently, the lab has adopted a camera-based approach for tracking wing motion because it is more convenient for physiology and imaging. Lehmann, F.-O., and Dickinson, M. H. (1997). The changes in power requirements and muscle efficiency during elevated force production in the fruit fly, Drosophila. melanogaster, J. Exp. Biol. 200, 1133–1143. Reiser, MB and Dickinson, MH (2008). A modular display system for insect behavioral neuroscience. J. Neurosci. Meth. 167, 127-139. Maimon, G., Straw, A., Dickinson, M. H. (2008). A simple visual algorithm for decision making in flying Drosophila. Current Biology, 18, 464-470. Motivated by the pioneering work of Rachel Wilson, the laboratory developed a method in which it is possible to access cells in the central brain for whole cell patch clamp while still allowing the animal to flap its wings and fly within a visual flight simulator. The technique is possible due to the development of a custom built stage that keeps the entire body of the fly free of saline while providing access to the back of the head capsule. The preparation was developed by Gaby Maimon while a post-doc in the lab with the help of Andrew Straw. Maimon, G., Straw, A.D., Dickinson, M.H. (2010). Active flight increases the gain of visual motion processing in Drosophila. Nature Neuroscience 13, 393-399. Suver, M., Mamiya, A., Dickinson, M.H. (2012). Octopamine neurons mediate flight-induced modulation of visual processing in Drosophila. Current Biology, 22, 1-9. Schnell, B., Weir, P., Roth E., Fairhall, A.L. and M.H. Dickinson (2014). Cellular mechanisms for integral feedback in visually-guided behavior. PNAS 111, 5700-5705. 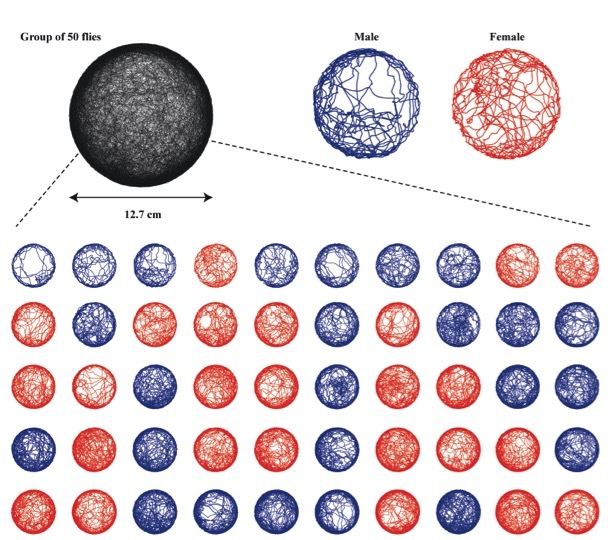 Weir, P., Schnell, B., Dickinson, M. H. (2014) Flight-dependent responses to progressive visual motion in central complex neurons of Drosophila. J. Neurophysiol. 111, 62-171. Schnell, B., Weir, P. T., Roth E., Fairhall, A.L. and Dickinson, M. H. (2014). Cellular mechanisms for integral feedback in visually-guided behavior. PNAS 111, 5700-5705. Weir, P. T. and Dickinson, M. H. (2015). Functional divisions for visual processing in the central brain of flying Drosophila PNAS 201514415. The laboratory adopted high speed videography in the early 1990’s when the devices such as the Kodak Ektapro became available. Early experiments combined high speed videography with electrophysiology to study the neuro-motor mechanics of wing control. We have also used high speed videography to study the sensory and motor control of both takeoff and landing. Our current work employs an array of three cameras operating at 7500 frames per second to capture the full wing and body kinematics of free flying flies. The animals are flown within a large cylindric LED arena so that it is possible to capture the reactions to controlled visual stimuli. Such experiments require the use of sophisticated machine vision algorithms for extracting kinematic data from the image stream, which was developed by Ibraheem Fontaine, while a graduate student in Joel Burdick’s lab at Caltech. All of our experiments are performed with near IR lighting (860-880 nm), so that the extremely high light intensities required for high speed imaging do not interfere with the animals’ visual perception. Tu, and Dickinson, M. H. (1996). The control of wing kinematics by two steering muscles of the blowfly (Calliphora vicina). J. Comp Physiol., 178, 813-830. Fry, S. N., R. Sayaman, M.H. Dickinson (2003). The aerodynamics of free-flight maneuvers in Drosophila. Science 300: 495-498. Card, G., and Dickinson, M.H. (2008). Visually mediated motor planning in the escape response of Drosophila. Current Biology 18, 1-8. 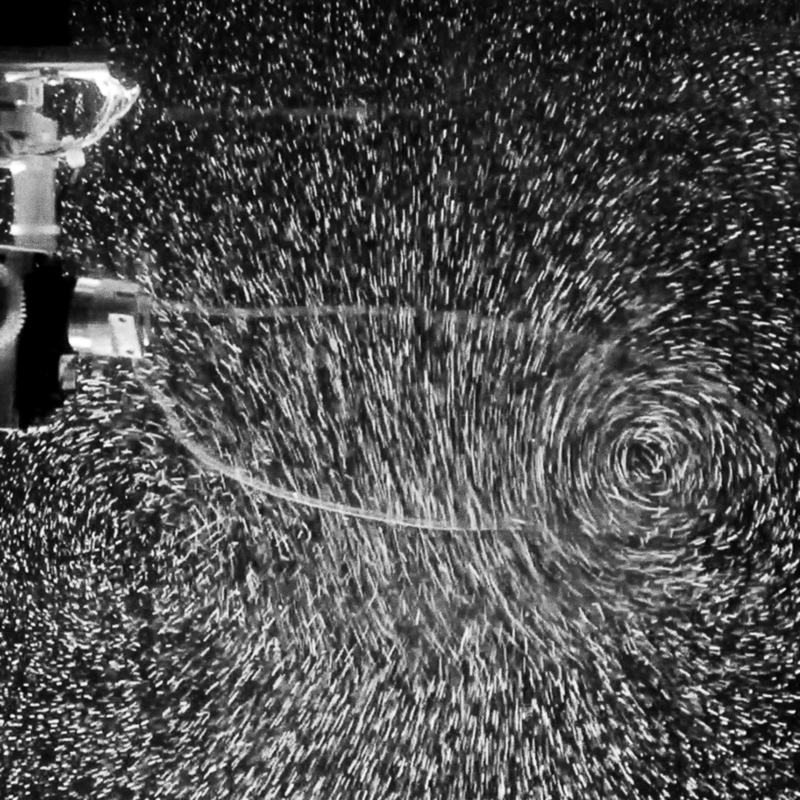 Fontaine, E. I., Zabala, F., Dickinson, M.H., and Burdick, J. W. (2009) Wing and body motion during flight initiation in Drosophila revealed by automated visual tracking. J. Exp. Biol. 212, 1307-1323.
van Breugel, F., and Dickinson, M. H. (2012). The visual control of landing in the fruit fly, Drosophila. J. Exp. Biol. 215, 1783-1798. Muijres, F.T., Elzinga, M.J., Melis, J., Dickinson, M.H. 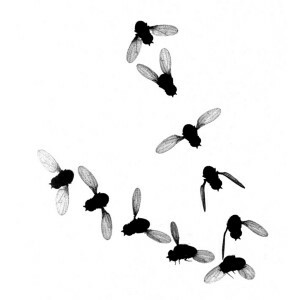 (2014) Flies evade looming targets by executing rapid visually-directed banked turns. Science 344, 172-177. 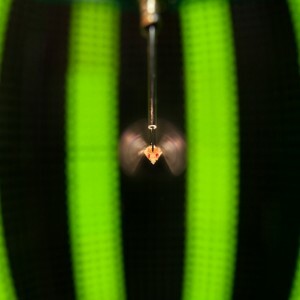 The laboratory has extensively modified a research grade low velocity wing tunnel (Engineering Laboratory Design) so that it is possible to track free flying flies in real time while presenting them with controlled sensory stimuli (visual, olfactory, mechanosensory, and thermal). Early implementations uses the TrackFly system developed by Steven Fry, a former post-doc in the lab. Later, we developed a multi-camera machine vision system called ‘flydra’, developed primarily by Andrew Straw. The multi-camera design of flydra (our current configuration uses 12 GB Ethernet cameras) makes it possible to track flies over a relatively large volume, thus permitting the study of behaviors such as plume tracking. The system is equipped with a projection system so that static or dynamic images may be presented on the floor and wall of the tunnel. We introduce odors into the upstream portion of the tunnel for olfactory experiments. Because the tracking is done in real time, it is possible to implement feedback-mediated stimulus paradigms such as virtual open-loop and a virtual reality. The system has also been outfitted with vanes and pistons to study gust responses. Fry, S.N., Rohrseitz, N., Straw, A.D., and Dickinson, M.H. 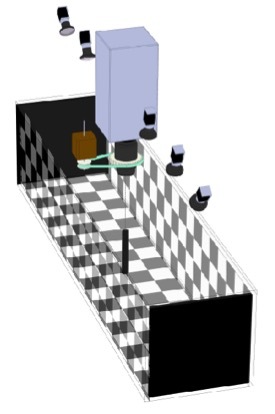 (2008) TrackFly: Virtual reality for a behavioral system analysis in free-flying fruit flies. J. Neurosci. Meth. 171, 110-117. Straw, A.D., Branson, K., Neumann, T.R., and Dickinson, M.H. (2010). Multi-camera real-time 3D tracking of multiple flying animals. 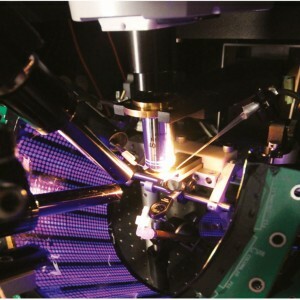 Royal Society Interface, doi:10.1098/rsif.2010.0230. Straw, A., Lee, S., and Dickinson, M. H. (2010). The visual control of altitude of flying Drosophila. Current Biology, 20, 1550-1556.
van Breugel, F., and M.H. 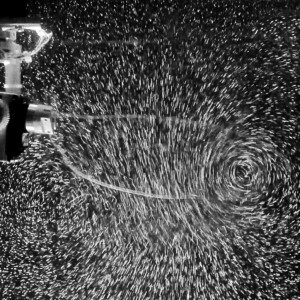 Dickinson (2014) Plume tracking behavior of flying Drosophila emerges from a set of distinct sensory-motor reflexes. Current Biology 24, 274–286. Fuller, S.A., Straw, A.S., Peek, M.Y., Murray, R.M., Dickinson, M.H. (2014). Flying Drosophila stabilize their vision‐based velocity controller by sensing wind with their antennae. PNAS 111, E1182 – E1191. The laboratory has developed a number of machine vision systems for tracking one or more flies as they walk within a planar arena. All these systems use infrared lighting and a single camera. Three problems plague tracking efforts of f lies: 1) identify swaps and mergers that occur when tracking multiple flies, 2) the wall-following behavior that flies exhibit when they encounter the circular boundary and an arena, and 3) errors in interpretation due to flies that walk on the ceiling (if present) of the arena. Kristin Branson developed the Ctrax software suite while working as a post-doc on a CRCNS grant to the Dickinson and Perona labs at Caltech. Ctrax is capable of maintaining the identity of individual flies for reasonably long periods of time, permitting higher throughput and more powerful statistical analysis. To assist many tracking experiments and in particular to synchronize image capture with parallel data streams, Andrew Straw developed a FMF (fly movie format), while a post-doc in the lab. FMF and a newer mFMF are convenient formats for collecting data to be analyzed with Ctrax. Many tracking projects, however, require real-time estimates of fly position and orientation and most recent project in the lab operate using a simple machine vision procedure, developed by Steve Safarik, which runs as a node in ROS. To keep flies from walking around the walls of the arena, the lab used to employ fine heated wire to create an aversive stimulus. While a graduate student, Jasper Simon developed the ‘flybowl’ arena, in which the floor of the arena tapers (c. 11 deg) towards the boundary, creating a narrow space that flies natural avoid. This geometry is also very efficient at keeping flies from walking on the ceiling. Coating a glass ceiling with Sigmacote (Sigma-Aldrich) also inhibits flies from walking upside down. Branson, K., Robie, A., Bender, J., Perona, P., and Dickinson, M.H. (2009). High-throughput ethomics in large groups of Drosophila. Nature Methods, 6, 451-457. Robie, A., Dickinson, M.H. (2010). Object preference by walking fruit flies, Drosophila melanogaster, is mediated by vision and graviperception. J. Exp. Biol. 2010 213: 2494-2506. Simon, J. and Dickinson, M. H. (2010). A new chamber for studying the behavior of Drosophila. PLoS One. Schneider, J., Dickinson, M.H., and Levine, J. (2012). Social network structure depends on innate determinants and chemosensory processing in Drosophila. PNAS doi: 10.1073/pnas.1121252109. 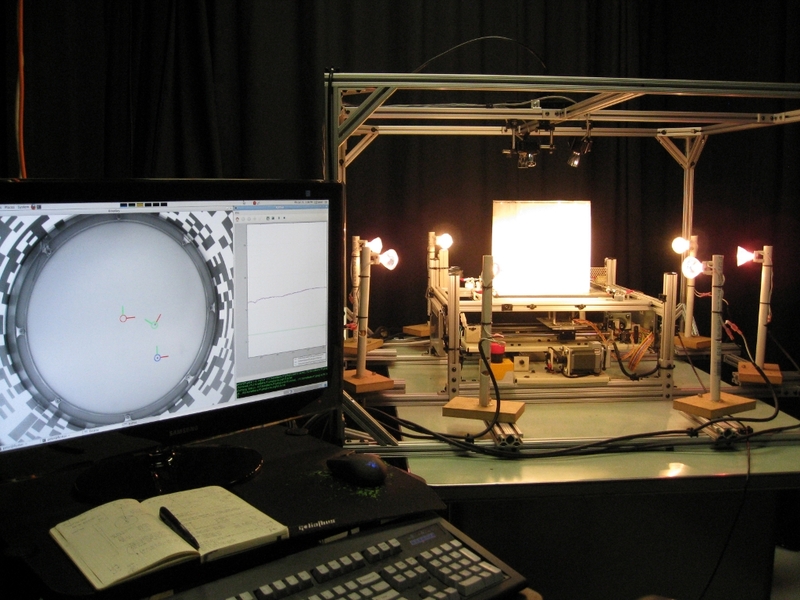 Flyatar is a robotic system in which it is possible to control the motion of a small fly-sized objection while it interacts with a real fly inside a large circular arena. The fly dummy consists of a small neodymium magnet and its motion is controlled by a sub-stage driver magnet that is actuated by a set of servo motors. 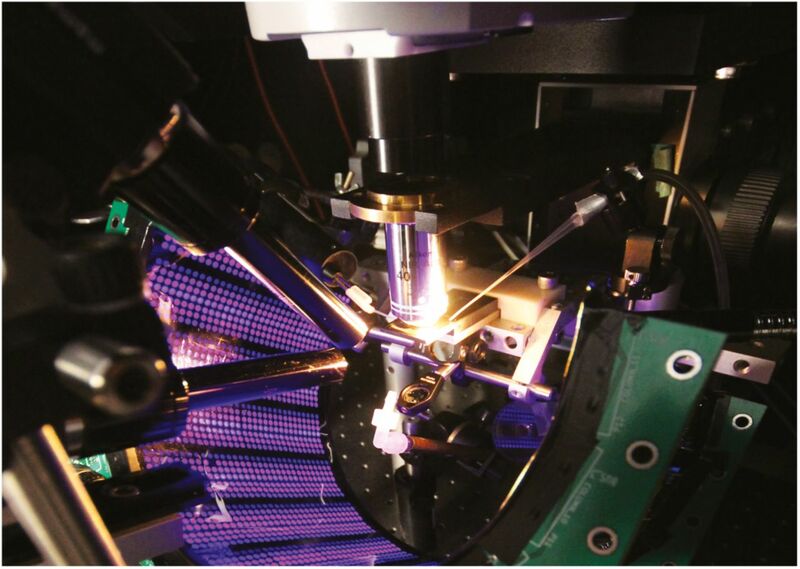 A machine vision system is used to track the position of both the real and dummy fly, and experiments may be performed in either open-loop or closed-loop configurations. The first version of flyatar was designed by Peter Polidoro, and the most recent version was designed by Steve Safarik. Both systems use ROS (Willow Garage) as an operating system. 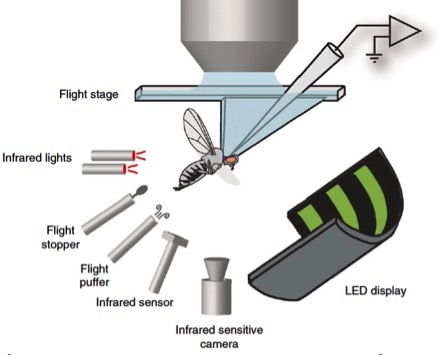 Flyatar works because the visual resolution of Drosophila is poor, and thus they cannot tell the difference between a real fly and the simple robot. This principle is demonstrated by the fact that male flies will orient towards, chase, and sing to a dummy fly as if it were a real female. The dummy may be coated with extracted pheromones to study their role in courtship and other behaviors. Zabala, F., Polidoro, P., Robie, A., Branson, K., Perona, P., and Dickinson, M.H. (2012). Detecting motion while moving: a simple algorithm revealed by animal-robot interactions. Current Biology 22, 1344-1350. Agrawal, A, Safarik, S. Dickinson, M.H. (2014) The relative roles of vision and chemo-sensation in mate recognition of Drosophila. J. Exp. Biol. 217, 2796-2805.